Lorraine Paton: A Taste of Local Authors! I'm thrilled to be participating in A Taste of Local Authors, which is a local Calgary event on December 12th! I'll be reading from Annie's Christmas Plan, which will be releasing soon! To keep up-to-date on the event's news, check out the Facebook event page! Thank you to Sarah Kades for letting me know about this event, and to Randy McCharles for organizing it! It'll be a great night! 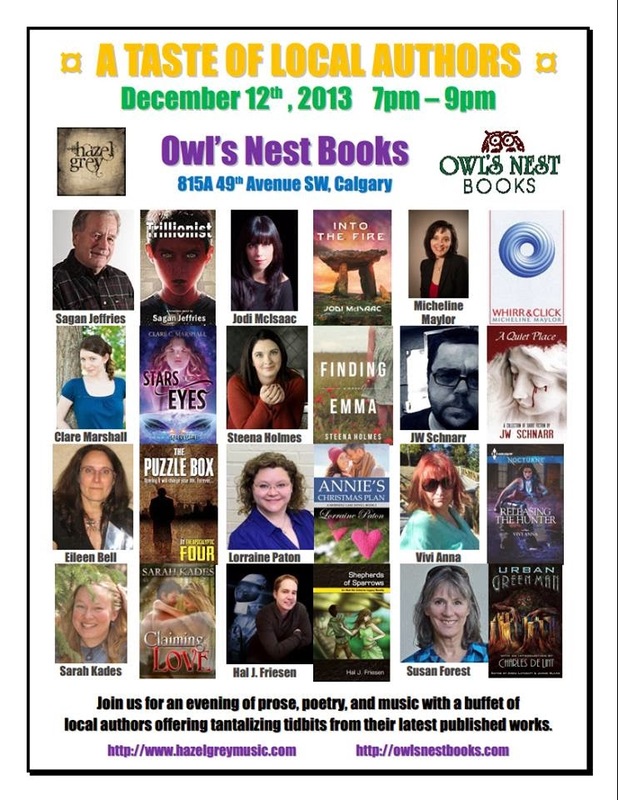 If you are in Calgary, I hope you'll come out and join us! How exciting! And I love the Owl's Nest bookstore--haven't been there in years. I've marked the date on my calendar. Thanks! I've never done anything like this before, but I think it'll be a lot of fun! :) See you there! I won't be able to make it:- Husband away working, children at home, I live 3 hours away, etc. So, you will have to post and tell us how it went. Congratulations Lorraine. I hope you have fun.